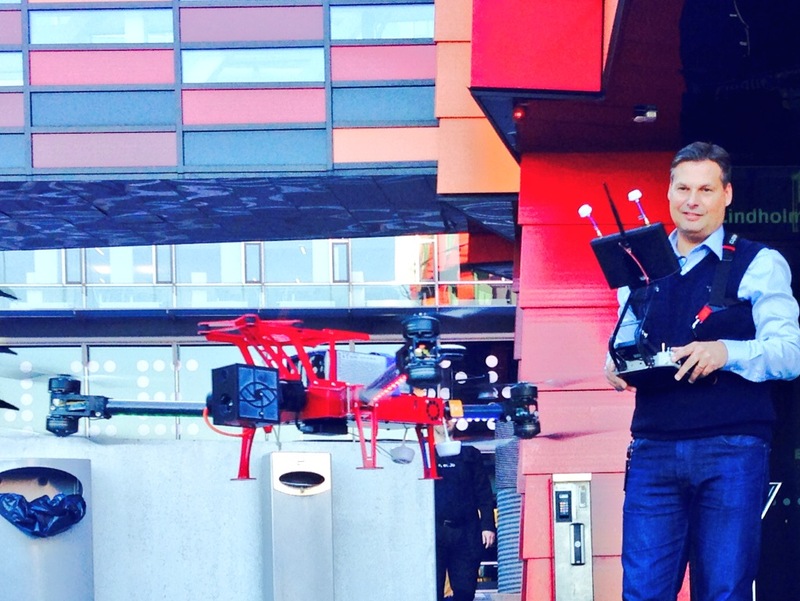 Drones – part of the fire services toolbox? There are a few things that seems to really intrigue people to such an extent that they without hesitation cancel their plans or at least interrupt their immediate plans. Drones are an excellent example of this. 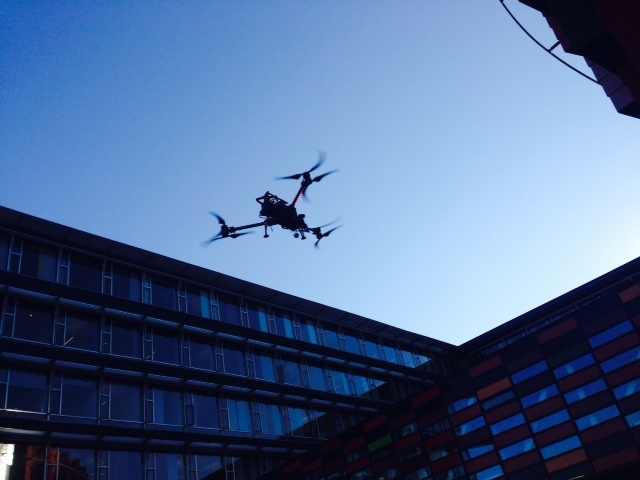 Today, friends from SAAB and Lindholmen Science Park organized a nice drone-seminar and demo at the Kuggen-building where we at Interaction Design at Chalmers have our offices. This meant that my morning plans were slightly modified since I was intrigued by the demonstration of one of the drone-platforms. The seminar attracted a diverse group of people including people from the local fire and rescue services. My immediate impressions from the demo is that drones seems to have developed from being a nerdy-techie-hobby to now transformed into something much more off-the-shelf and consumer friendly. A fair bet is that drones will become a common sight at accidents sites and disaster areas in the near future. The capabilities of drones to provide overview using photos, video-streams and bulks of sensor data seems unprecedented thanks to is impressive in-flight abilities. It will be interesting to see which one of the three large fire services in Sweden that will start to have drones as part of their standard toolbox for response operations. Mot bakgrund av de utmaningar som Svensk krishantering står inför på lokal, regional och nationell-nivå så är det dags att organisera ett CrisisCamp. Syftet med ett CrisisCamp är att genom extremt fokuserat arbete, tillsammans i större team med olika kompetenser, dra nytta av informationsteknologi för att skapa bättre förutsättningar till effektiv hantering av krissituationer eller större händelser. Ett CrisisCamp är öppet för alla som vill vara med och bidra med sina erfarenheter och kompetens. Planen är att köra ett 24 timmars CrisisCamp under senare delen av våren 2011 på Lindholmen i Göteborg. Vi söker nu engagerade deltagare från privata sektorn, kommuner, räddningstjänst, ambulanssjukvård, polis, länsstyrelse, smittskydd, sektorsmyndigheter och nationella myndigheter. Vid detta CrisisCamp kommer deltagarna att formera olika grupper som tar fram förslag och prototyper på nya tjänster som förbättrar förmåga till samverkan och samarbete vid större händelser och kriser. CrisisCamp began as an idea for an event to bring together people who were interested in leveraging technology and telecommunications systems to assist communities in times of crisis. How should we move ahead…. At the 6th International Conference on Information Systems for Crisis Response and Management (ISCRAM2009), I as a conference co-chair had the opportunity give a very short introduction speech. As always in such occasions it is typically a speech with many nice words and hopes for the future. My speech was no exception. The only exception is that I personally believe that we as researchers in this domain seriously should make strong efforts in moving in this very direction. The road ahead will not be easy but from my perspective, our options are few. So what was my speech all about? Here are the key issues. Have in mind that I have removed the more ceremonial aspects of the speech. We are all in the business of information technology in crisis response. What does this really mean? I do believe that there are some demands attached. We as a community must make our very best not only in conducting high quality research and raise the quality standards of our mutual efforts. But also that we in the future, starting already today, must be able to deliver rigorous as well as relevant results to both academia and practice. If we neglect either side, we face the risk of losing substantial values that we as a community could provide. So, we must apply existing methods and also develop new methods for end-user involvement, the participation of professionals in our design activities, as well as plan and execute collaborative projects targeting the perspectives of decision makers and policy-makers in local organizations and government agencies. However this is not enough, we should also make stronger efforts in transferring our results into a market setting in order to ensure that more innovative products and services will become available for professional and grass-root users. We must release our prototypes from our labs and into the wild. And we should do this on a massive scale. All these things are too much for anyone of us to carry out. Instead we must increase our efforts in establishing inter-disciplinary research teams. Not as a facade but because we see the true value of it. The big question is, how many are willing to follow and move ahead along this bumpy road? On thursday the 23rd of April, me and my colleague Fredrik Bergstrand attended a TableTop-execercise focusing on Pandemic flu. It was a good exercise where different organizations explained how they would work during the different stages of the escalation of a pandemic disease. In relation to what the world became aware of just two days later, this exercise became much more interesting that initially experienced. It is always good to get insights on the planning process as well as experiencing what really takes place when the event everyone has waited for actually do occur. The excercise was organized by the Regional Administrative board together with the regional health authorities and the local government. It is now time to send in applications for the ISCRAM Summer School 2008. The summer school is an excellent opportunity for PhD-students and practitioners within the IS/IT- field with a focus on emergency and disaster response. Previous years have provided invaluable opportunities for networking between various types of ongoing research as well as superior connections to emergency and disaster response professionals. The application deadline is already quite close, so discuss with your colleagues or friends who might be interested. From my point of view, all PhD-students that claim to do research in this important area should seriously consider to apply. The Summer School is organized by my colleagues Paul Burghardt, Ron de Milde, Janneke Liebregts – van Maarle, Jan Otten and Bartel Van de Walle. Webinar on hazards detection and monitoring at public events on April 17, 2008. Today, I received an email about this webinar that will be held on april the 17th. Seminar on hazards detection and monitoring at public events on April 17, 2008. It’s every first responder’s toughest challenge; how do you monitor hazardous incidents and ensure the public safety at major venues in real-time? It is not easy, given the multiple technologies and amount of data available today. This presentation provides an overview of existing detection sensor technologies and decision support tools for hazardous area monitoring, with emphasis on real-time integration and interpretation. A systematic approach for identifying unknown environments by merging these different sensor technologies is discussed, and benefits including increased safety, efficiency, and command control are highlighted.